David Robert Holmes was born January 31, 1917 in Dolan, Spink County, South Dakota. Known as "Bob" and occasionally Robert to family and friends, he entered the Army from Fort Snelling, Minnesota on January 24th 1941. 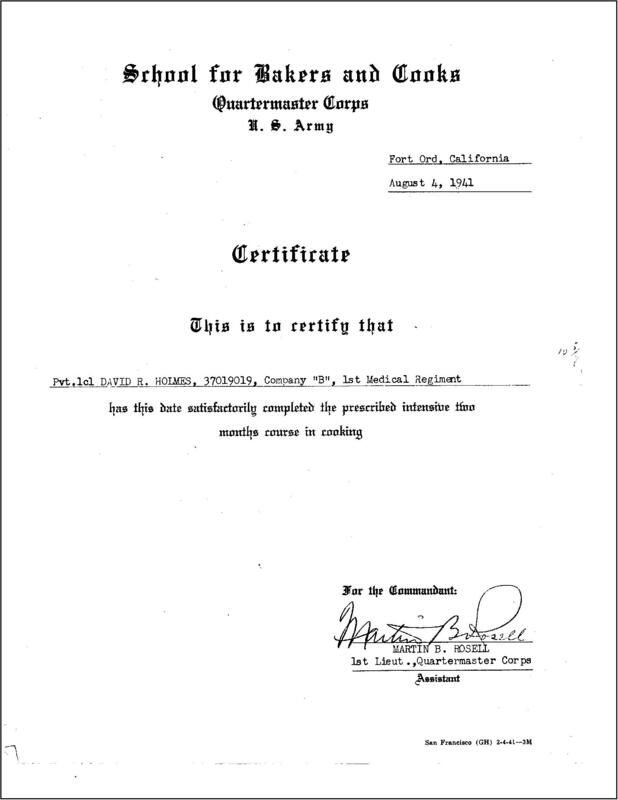 After completing his basic training at Fort Ord, California, Bob attended a bakers and cooks school. His first assignment was with the 1st Medical Regiment in B company. 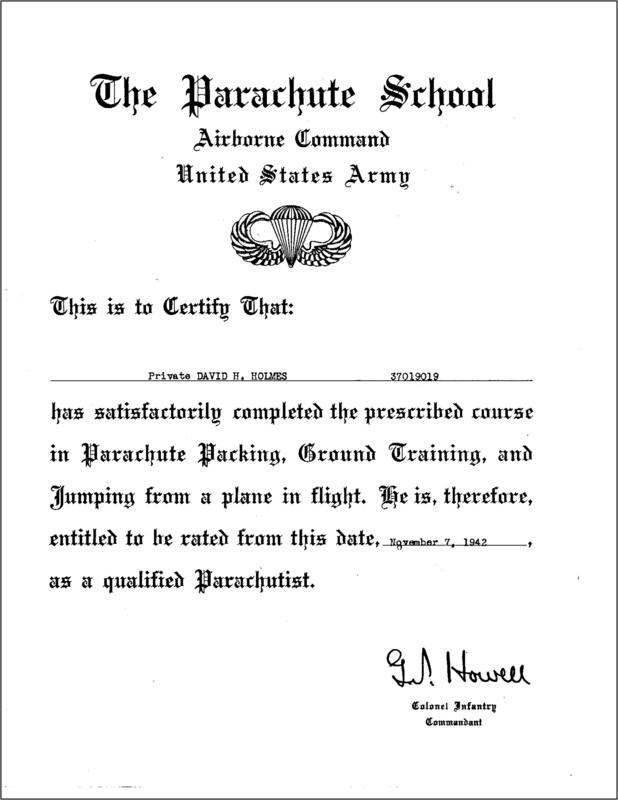 Sometime in 1942 he volunteered for the paratroopers and completed jump school on November 7th 1942. 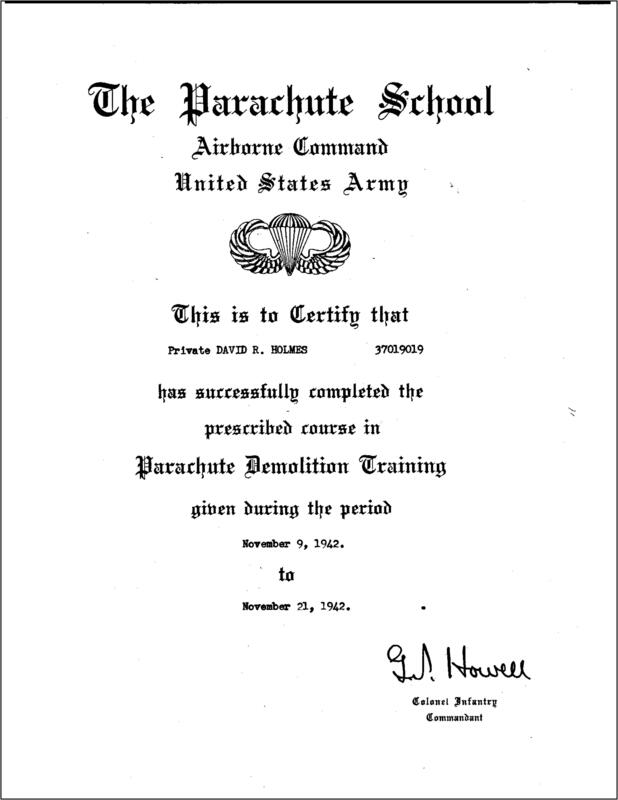 After completion of Parachute Demolition School he was assigned to the 505 Parachute Infantry Regiment, B company. 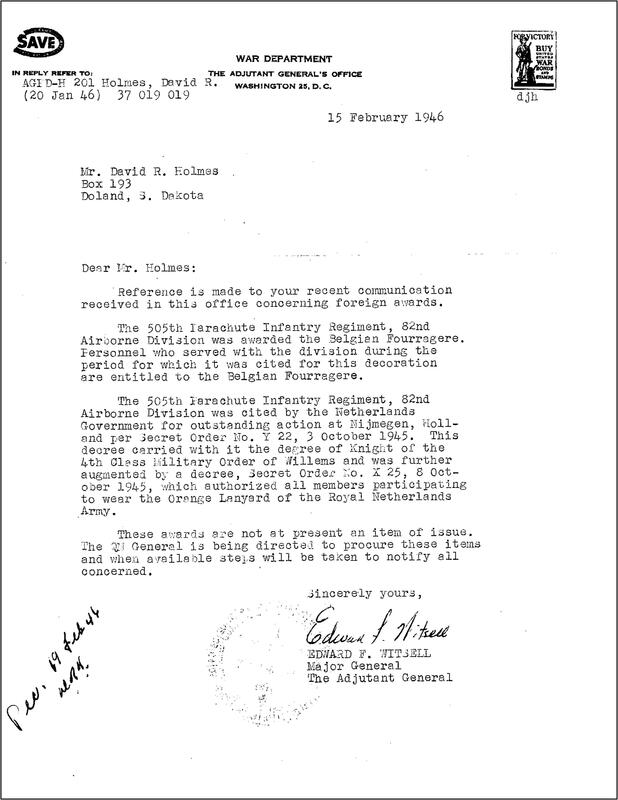 Bob went overseas as part of the 505 Regimental Combat Team at- tached to the 82nd Airborne Division on April 29th 1943 arriving in North Africa on May 10th. He served in all six European theatre campaigns and was wounded on D-Day June 6th 1944 in Normandy, France earning him the Purple Heart medal. Staff Sergeant Holmes made all 4 combat jumps, Sicily, Italy, Normandy and Holland, according to his son David. The seven or eight documents below give a good accounting of his time spent in the service of his country. A high point veteran with an ASR score of 116 points, Bob was honorably discharged August 30th 1945 from Camp McCoy, Wisconsin. 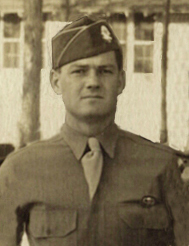 David R. Holmes, Fort Bragg early 1943. 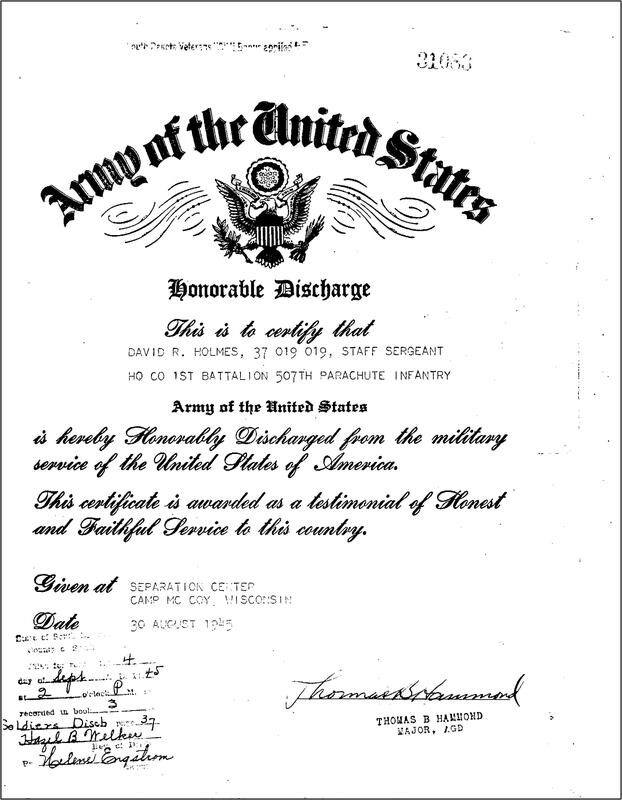 David's 1945 Discharge - Part 2 , he was a high point veteran (ASR score 116) and went home before the 1,000 or so 82nd Airborne Division paratroopers that went home in September of 1945. 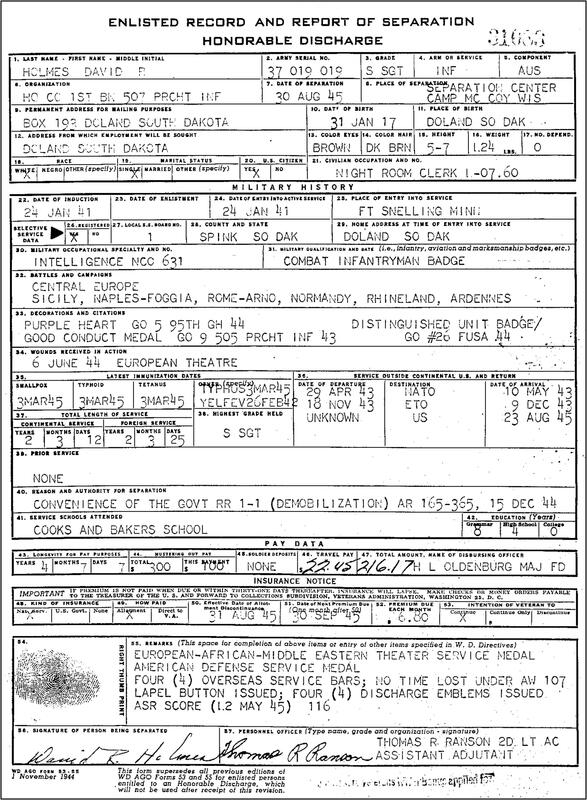 David's 1945 Discharge - Part 1 . Long before volunteering to become a paratrooper, and after David completed his basic training, he attended cooks and bakers school in August of 1941 at Fort Ord, California. David's first assignment was the 1st Medical Regiment, B company, also located at Fort Ord. 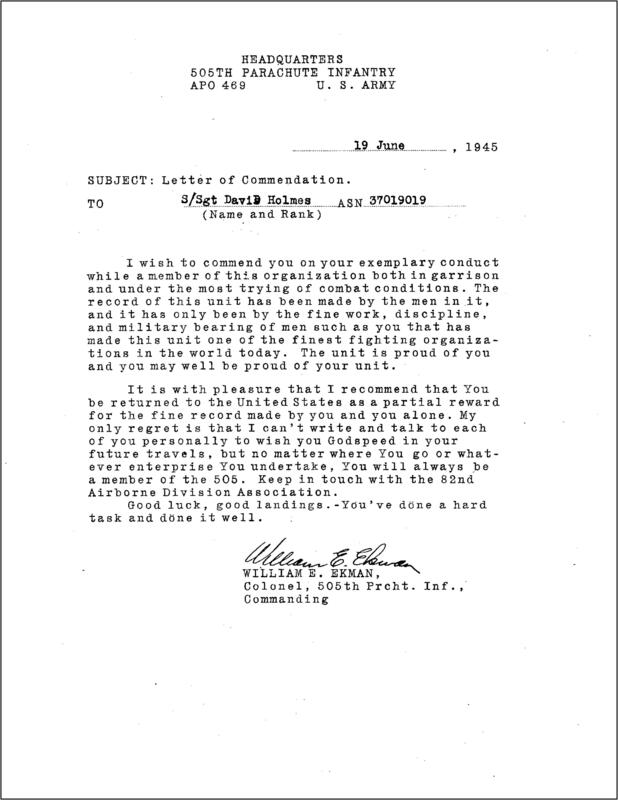 1946 Letter to the War Department Adjutant General's Office. 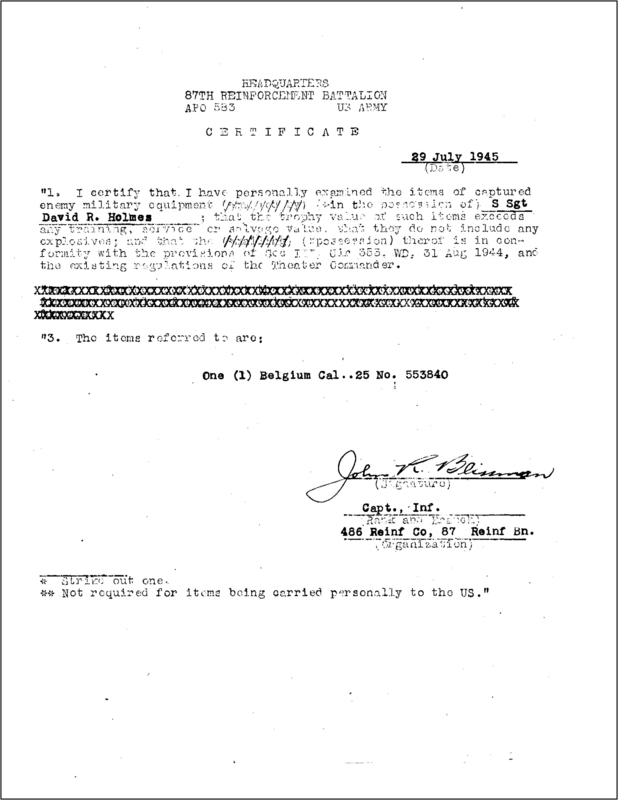 Letter certifying captured enemy military equipment, a 25 caliber Belgium pistol.